^ Logan, Carolynn M.; Rice, M. Katherine. Logan's Medical and Scientific Abbreviations. Philadelphia: J. B. Lippincott Company（英语：J. B. Lippincott Company）. 1987: 3. ISBN 0-397-54589-4. ^ 2.0 2.1 2.2 2.3 2.4 2.5 2.6 2.7 2.8 2.9 Kent KC. Clinical practice. 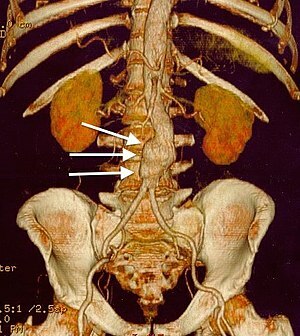 Abdominal aortic aneurysms.. The New England Journal of Medicine. 27 November 2014, 371 (22): 2101–8. PMID 25427112. doi:10.1056/NEJMcp1401430. ^ 3.0 3.1 Upchurch GR, Schaub TA. Abdominal aortic aneurysm. Am Fam Physician. 2006, 73 (7): 1198–204. PMID 16623206. ^ Spangler R, Van Pham T, Khoujah D, Martinez JP. Abdominal emergencies in the geriatric patient.. International journal of emergency medicine. 2014, 7 (1): 43. PMID 25635203. doi:10.1186/preaccept-3303381914150346. ^ Wittels K. Aortic emergencies.. Emergency medicine clinics of North America. November 2011, 29 (4): 789–800, vii. PMID 22040707. doi:10.1016/j.emc.2011.09.015. ^ 6.0 6.1 Aortic Aneurysm Fact Sheet. cdc.gov. July 22, 2014 [3 February 2015]. ^ Cinà CS, Devereaux PJ. Review: population-based screening for abdominal aortic aneurysm reduces cause-specific mortality in older men. ACP J. Club. 2005, 143 (1): 11. PMID 15989299. ^ Robinson, D; Mees, B; Verhagen, H; Chuen, J. Aortic aneurysms - screening, surveillance and referral.. Australian family physician. June 2013, 42 (6): 364–9. PMID 23781541. ^ Thomas DM, Hulten EA, Ellis ST, Anderson DM, Anderson N, McRae F, Malik JA, Villines TC, Slim AM. Open versus Endovascular Repair of Abdominal Aortic Aneurysm in the Elective and Emergent Setting in a Pooled Population of 37,781 Patients: A Systematic Review and Meta-Analysis.. ISRN cardiology. 2014, 2014: 149243. PMID 25006502. doi:10.1155/2014/149243. ^ Biancari F, Catania A, D'Andrea V. Elective endovascular vs. open repair for abdominal aortic aneurysm in patients aged 80 years and older: systematic review and meta-analysis.. European journal of vascular and endovascular surgery : the official journal of the European Society for Vascular Surgery. November 2011, 42 (5): 571–6. PMID 21820922. doi:10.1016/j.ejvs.2011.07.011. ^ Paravastu SC, Jayarajasingam R, Cottam R, Palfreyman SJ, Michaels JA, Thomas SM. Endovascular repair of abdominal aortic aneurysm.. The Cochrane database of systematic reviews. 23 January 2014, 1: CD004178. PMID 24453068. doi:10.1002/14651858.CD004178.pub2. ^ Ilyas S, Shaida N, Thakor AS, Winterbottom A, Cousins C. Endovascular aneurysm repair (EVAR) follow-up imaging: the assessment and treatment of common postoperative complications.. Clinical radiology. February 2015, 70 (2): 183–196. PMID 25443774. doi:10.1016/j.crad.2014.09.010.